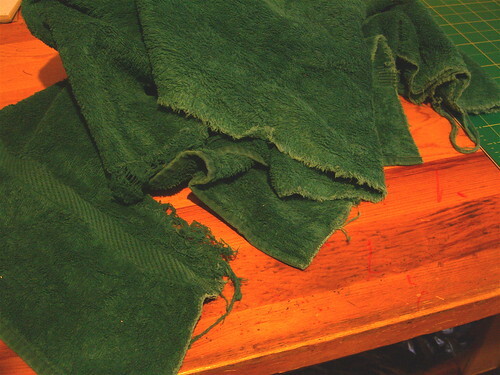 September 16, 2008 by cakehouse in "Cakehouse", "DIY", "bath", "bathroom", "crafts", "how-to", "project", "recycle", "recycling", "salvage", "tutorial", "upcycle"
unusable as a towel, that is. as the base for a new bath mat, it was perfect. 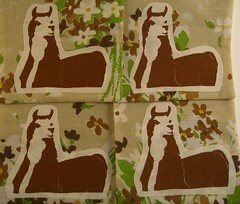 and so i embarked on a project to dress up our bathroom. 1) cut your towel into two equal-sized rectangles, at whatever size will fit best in your bathroom. 2) iron your fabric, and cut it into strips that are 4-1/2" wide, and 4" longer than the sides of your rectangle in length (so, unless you've cut squares out of your towel, you'll have 2 strips of one length and 2 strips of another). 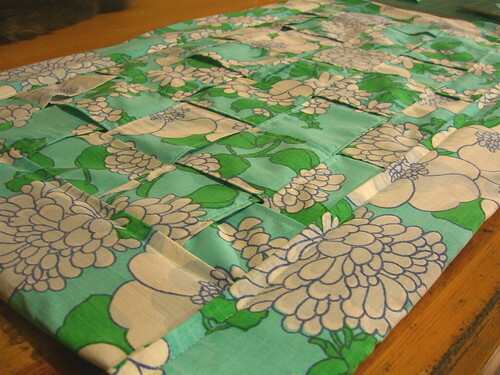 then fold back 2" at the short ends of each strip, and iron down. 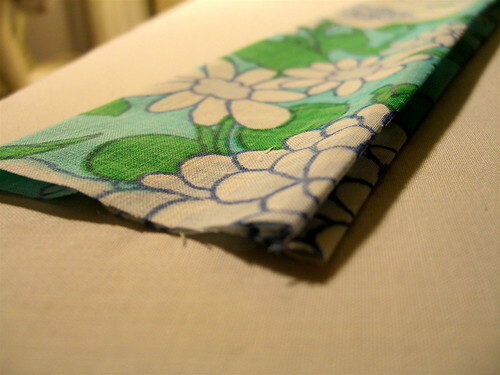 5) if you like the way it looks at this point, just sew a straight stitch along the inside edges of the border, being sure that you catch both the front and back edges, and you're all done! 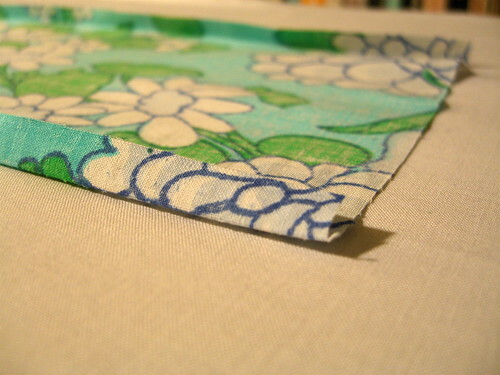 start by cutting a bunch of strips of fabric in a width that looks appealing to you (i used 2"). remember to add a 1/2" to that width for finishing the edges. 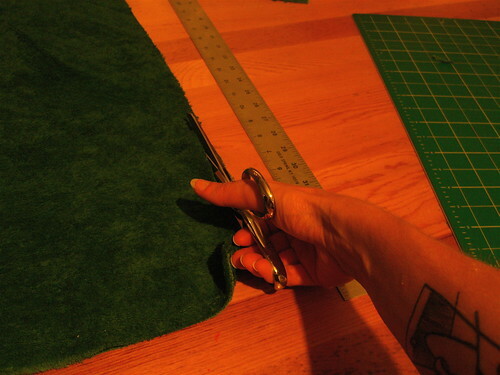 measure the open space of your mat that you need to fill, and figure out how many strips you need to cut to fill it. 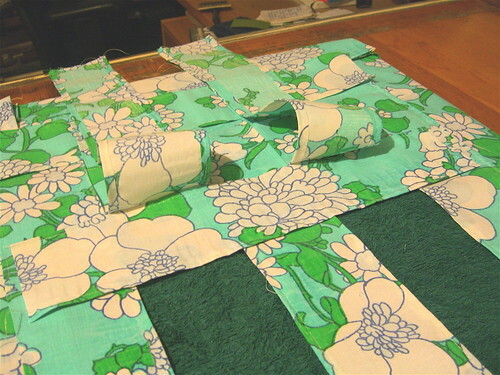 for length, cut them an inch longer than the open space, to allow for them to overlap (or, acutally, underlap) with the border fabric. 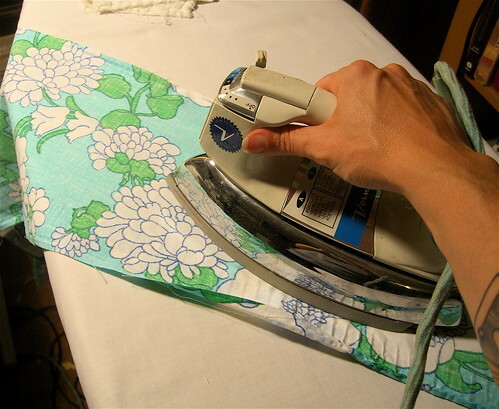 iron down a 1/4" on each of the long sides of the strips, then sew them down with a straight or zig-zag stitch. 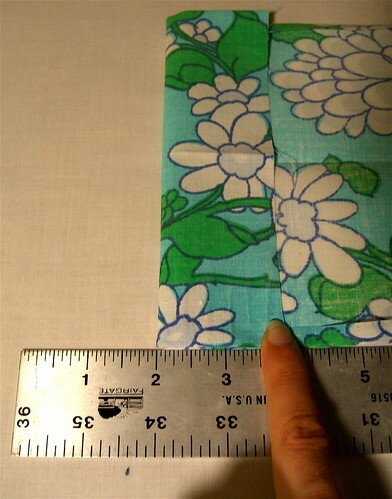 **if you are working with a fabric that's prone to fraying, add 1" to the width that you decide on for the strips, and fold the edges of the fabric over on themselves again before sewing down. 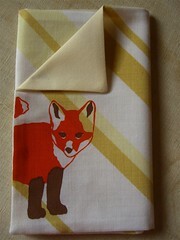 ...pin them around the edges, and baste them to the towels. 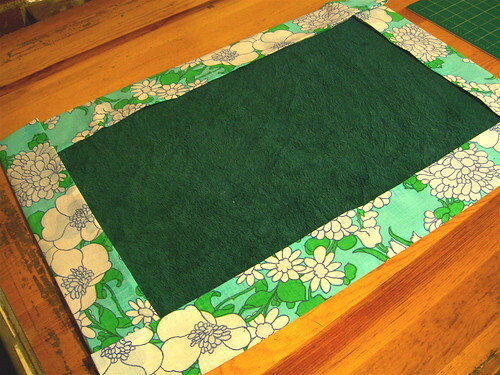 8) then put the border fabric back in place, fold it over the lattice, and pin it down. 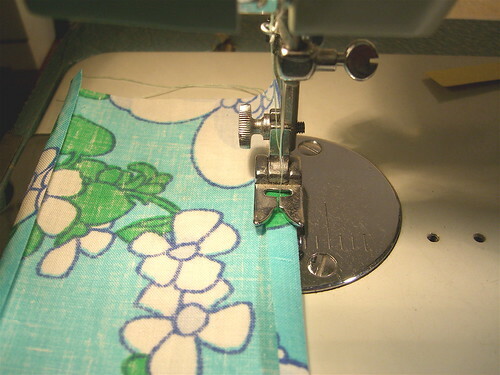 sew a straight stitch along the inside edges of the trim, being sure that you go through both the front and back edges. "Cakehouse", "DIY", "bath", "bathroom", "crafts", "how-to", "project", "recycle", "recycling", "salvage", "tutorial", "upcycle"
March 15, 2008 by KimmChi in "NYC", "donate", "electronics", "manhattan", "recycle", "recycling", "waste reduction"
Tomorrow morning is the Manhattan electronics recycling and clothing donation day event at Union Square North Plaza (southeast corner of 17th St. and Broadway). They will be excepting electronics donations of computers & laptops, monitors, printers & scanners (desktop only), keyboards & mice, TVs, VCRs, DVRs & DVD Players, and cell phones. They will also be accepting gently used clothing with tax deductible receipts available upon request. It's only from 8am until 2pm, so get out there early! "NYC", "donate", "electronics", "manhattan", "recycle", "recycling", "waste reduction"
March 03, 2008 by cakehouse in "Cakehouse", "being green", "clothing", "fashion", "recycling", "sewing"
Like a lot of people, maybe you've been looking for ways to be more green. You've ditched the Clorox and the Lysol for the Seventh Generation and the Method, you're filling the fridge with organic apples from Long Island instead of strawberries flown in from New Zealand (and carrying them home in cloth bags instead of plastic), you're keeping the thermostat set low, you've filled all your sockets with the twirly lightbulbs. But how eco-friendly is your closet? I'm not talking about buying organic jeans from Bono—I'm talking about a way to apply your creative and artistic talent to reducing your fashion footprint. Wardrobe Refashion is an online community of people who have pledged to "abstain from the purchase of 'new' manufactured items of clothing" for 2, 4, or 6 months. Instead, they promise to "refashion, renovate, recycle preloved items...in fabric, yarn or other medium for the term of [their] contract." You're also allowed to buy new fabric and yarn to make clothes, and to buy handmade clothes, so Etsy shops are fair game! Shoes are exempt, as are underwear, though you're "encouraged to have a go at making those." (Hey, if Daniel Day-Lewis can do it, so can you.) 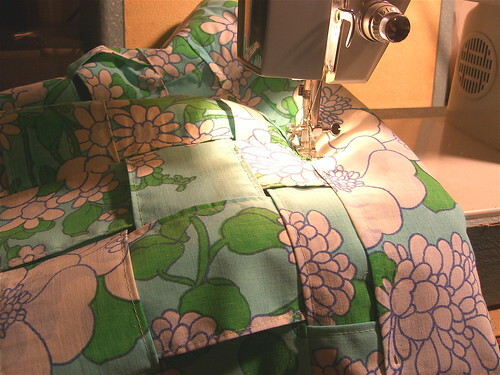 Members then post their projects on the Wardrobe Refashion site, which makes it great for novice sewers, as there are lots of tutorials and inspiration. Wardrobe Refashion was started by an Australian woman named Nicola Prested. She "wanted to save money, make less of an impact on the environment, increase my sewing skills and define my own style rather than buying off the rack what everyone else is buying," so made a personal decision not to buy new clothes for six months. She wrote about her experiment on her blog and asked if others would be interested in getting in on it—and got 60 takers. One of them suggested she start a group blog for everyone making the no-new-clothes pledge, and Wardrobe Refashion was born. A Refashion Flickr group has also been formed, if you'd like less text with your photos. So check it out, maybe start light with a 2-month pledge..... I'm on month 8 and not looking back. "Cakehouse", "being green", "clothing", "fashion", "recycling", "sewing"